Home > australia > Bryce McGain > cricket > cricket australia > england > johnson > ponting > The Ashes > Is Australian Cricket Missing The Point? Is Australian Cricket Missing The Point? The immediate aftermath of Ashes 09 has predictably seen a flurry of opinions pertaining to everything and anything that may be wrong with Australian cricket. A lot of this noise has been made by the top chiefs and former players about the need to professionalise Australia's selection panel, with Jason Gillespie the latest to proffer his two-cents-worth. However, does a professional panel necessarily improve on-field results or does it just make them more predictable? I put it to you that in its haste to exhibit disappointment and an appetite for change, Australian cricket has simply missed the point. I believe that Australia's cricket establishment has been blinded by the success of its recent crop of greats and it should have indulged less in self-absorbed back-patting and doffed the Baggy Green more earnestly to pure and unadulterated luck, for good systems and processes may help to produce more consistent cricketers but true greats arrive on our TV screens through nothing more than the grace of God. It is because of this mindset that Australia's most recent loss of The Ashes is being universally attributed to a failure of the system and the real reasons for this loss are being ignored. I have no quibble with expert's suggestions that the job of an Australian selector (or that of any other top cricketing country, for that matter) is likely too arduous and important to leave to semi-professional part-timers. It should be made a full-time position and in this post-greats era it definitely should have a greater emphasis on early talent identification and promotion. However, this alone is unlikely to take Australia back to the top of the ICC Test rankings. 2. Aggressive, in-your-face cricket is the Australian way and must be played at all costs. The reason Australia lost The Ashes is not because the selectors failed to devote enough time to their duties, but because they took the safe and sensible route when the daring and provocative was the need of the hour. The Australian selectors sent a team to England that ticked all the boxes rather than one that was going to take the proverbial bull by the horns. Then, while in Her Majesty's backyard they didn't exhibit the gumption to make changes as and when the situation demanded. In contrast, the English selectors, contrary to all expectations, resisted the urge for knee-jerk reactions, backed their instincts and took calculated risks (the most decisive being one Jonathan Trott). At Leeds the English could have stacked the team with batsmen, played for a draw and waited for a fit Andrew Flintoff to return at The Oval. Instead, they stuck to their guns and selected a team they thought would win the Test. They traded on aggression throughout. On the other hand, Australia's selections favoured out-of-form bowlers and was based more on the captain's comfort level with favourite players rather than the conditions at hand or the interests of a balanced team. Is Bryce McGain so inferior to Andrew McDonald that he doesn't even deserve a place in the touring party? Especially after Shane Warne's debut, surely the selectors have learned that one bad debut Test doesn't warrant eternal exile? Is Mitchell Johnson so indispensable that the selectors couldn't bring themselves to cut their losses? Professionalism is an oft-abused term in cricket these days. Incompetent administrators simply fail to understand that batting, bowling and fielding is an art and not a mathematical equation. It is very easy to wax lyrical about aggression and ruthlessness when the obstacle in your path is not worthy of its title. It requires heightened self-confidence to stick to those guns when the periods between successive chews of the captain's fingernails become shorter and shorter. Australian cricket administrators must stop hiding behind irrelevant corporate management jargon. Australian cricket needs to rediscover its mongrel and self-worth, for cricket needs a strong and aggressive Australia. Can't help but agree. Cricket Australia has tried to neuter the team, get rid of the one who wouldn't conform to the nice boy mould and present a pleasant, "sporting" face. But don't forget that the world demanded it of them. AFter the famous Sydney test everyone and his dog stuck their knife into Ponting. Now, he is complimented on his sporting behavior, but lambasted for losing matches. I notice also, that other teams who complained about Australia's attitude have, if anything, upped the sledging themselves and talk themselves up as getting their own back on Oz by giving them back what they used to get. Welcome to The Match Referee mate. I don't think its double standards. 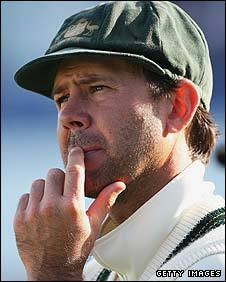 Ponting, given the way he carries himself these days, has clearly learned a few lessons from Sydney. By all reasonable accounts, his conduct was abhorrent. I don't think the Aussies have deliberately toned down their chatter. It's just that the current team is young, inexperienced and a lot more unsure of themselves, as compared to the team of three years ago. Hence they probably focus more on getting their own mental state right, rather than trying to forcibly alter the mental state of their opponents. And just on Vijay's comments, absolutely delighted to see my idol Rahul Dravid back in the Indian ODI side. Fully deserved and just what the Indian team needs in Sehwag's absence. Jammy will do India proud as he has since the 20th of June 1996. Welcome back. While I can't comment on M Hussey's captaincy abilities as I haven't seen him in action in that capacity, I can tell you that CA has invested far too much in Clarke to make anyone else captain. It simply won't happen, no matter how attractive the proposal. On Dravid, I'm with you on this one. I just hope against hope that someone has worked and is continuing to work with Suresh Raina and co to sort out their difficulties against the short ball. They are far too talented to be sacrificed at the BCCI's altar of greed, mismanagement and ignorance.